President Trump signed an executive action today that ends the administration’s policy of separating migrant families crossing the U.S.-Mexico border, abandoning the president’s previous stance that only Congress can fix the problem, as Politico’s Andrew Restuccia and Lorraine Woellert report. Dive Deeper: “Crisis at the Border? Not by the Numbers,” by the independent, nonpartisan Migration Policy Institute’s Jessica Bolter and Doris Meissner. According to the new Global Trends report from UNHCR, the forcibly displaced population worldwide increased in 2017 by 2.9 million - a new high for the fifth year in a row. By the end of the year, 68.5 million individuals were forcibly displaced worldwide as a result of persecution, conflict, or generalized violence. Dive Deeper : Read “Confronting the Global Forced Migration Crisis,” a report of the CSIS Task Force on the Global Forced Migration Crisis. Propaganda departments in China and North Korea were in full swing on Wednesday as Kim Jong-un, the North Korean leader, concluded a two-day tour of China that painted the once-reclusive autocrat as a forward-looking leader, as the New York Times reports. Dive Deeper : CSIS’s Michael Green testified today before the House Committee on Foreign Affairs Subcommittee on Asia and the Pacific on "The Trump-Kim Summit: Outcomes and Oversight." On the latest episode of the Impossible State, Where Do We Go from Here?, North Korean defector (and CSIS intern) Joseph Kim discusses human rights with Amb. Robert King, former special envoy for North Korean human rights issues. An airstrike close to the Iraq-Syria border Sunday was carried out by Israel, and not by the US or the coalition fighting ISIS, a US official tells CNN. According to CSIS’s Transnational Threats Project, Israel has conducted an increasing number of strikes in Syria in response to Hezbollah amassing significant capabilities in the region with the help of Iran. Dive Deeper : A CSIS Brief, “The Escalating Conflict with Hezbollah in Syria,” offers new data and satellite images on Hezbollah and Iranian sites in Syria, and Israeli strike locations. The number of people have been forcibly displaced by war, violence and persecution last year, a record number. "It's about keeping families together while ensuring we have a powerful border." A new brief from CSIS’s Transnational Threats Project explores the escalating conflict with Hezbollah in Syria. (Photo credit: Chip Somodevilla/Getty Images). 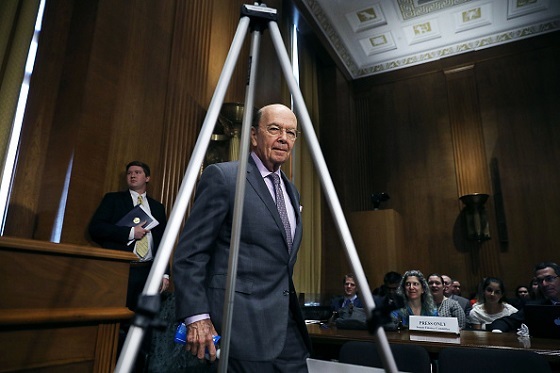 Secretary of Commerce Wilbur Ross arrives before testifying to the Senate Finance Committee about the Trump Administration's imposing of tariffs on steel and aluminum. CSIS’s “Space Threat Assessment 2018,” by Todd Harrison, Kaitlyn Johnson and Thomas Roberts. At 9:00 a.m., CSIS will host Ambassadors Claudia Ivette Canjura de Centeno of El Salvador and Marlon Ramsses Tábora Muñoz of Honduras for a discussion on the current state of the Temporary Protected Status (TPS) program, and its potential future impact on the Latin American and Caribbean region. Join CSIS at 2:00 p.m. for a conversation with author Gonzalo M. Quintero on his comprehensive new biography of Bernardo de Gálvez, Governor of Spanish Louisiana, with a particular focus on his support of the colonies in the American Revolution. At 2:00 p.m., CSIS will host a public event to highlight lessons learned from the 5-year Saving Mothers, Giving Life (SMGL) initiative, which aimed to dramatically reduce maternal and newborn mortality in Zambia, Uganda, and Nigeria. And at 6:00 p.m., CSIS will host a conversation with Lynn Good, Chairman, President and Chief Executive Office of Duke Energy, on the trends impacting the energy industry, the challenges it faces, and the efforts being made to create a cleaner, smarter energy future. CSIS hosted the ROK-U.S. Strategic Forum 2018: Assessing the Trump-Kim Summit. Scholars, experts, opinion leaders, and government officials from the United States and South Korea discussed the historic inter-Korean and U.S.-North Korean summit meetings, the potential for denuclearization, building a peace regime on the Korean peninsula, and regional implications of summit diplomacy for Northeast Asia. Watch the full discussion here. On the latest episode of The Impossible State, special guests Ambassador Robert King, former special envoy for North Korean human rights issues, and Joseph Kim, a young man who defected from North Korea in 2006, discuss human rights in North Korea and the Trump administration’s position on the issue in the aftermath of the Singapore Summit. NPR’s superb music critic Ann Powers wrote a fascinating piece in late May about Weezer’s cover of “Africa,” and why it resonates with a young audience. Powers explains this far better than I ever could. For me, the best thing is that Weezer recently performed “Africa” live on Jimmy Kimmel and it rocks.